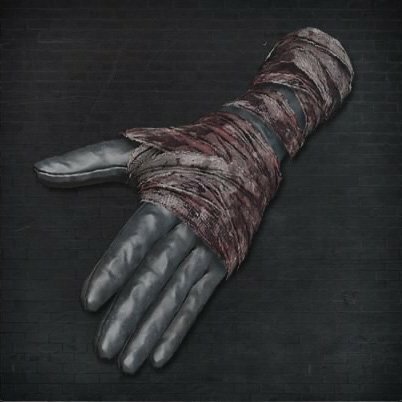 Bloodied Arm Bands is a Hand Armor/Attire in Bloodborne. It is part of Brador's Set and was added with The Old Hunters DLC. Brador donned a compatriot's beastly scalp and hide while still moist with blood. Most of the blood stains on this hide were from that day"
Dropped by invading NPC Brador at Fishing Hamlet: The bridge right before reaching the Lighthouse Lamp. You may only be invaded here after having reached the second lamp of the Fishing Hamlet and talked to the Harrowed Hunter (or reaching the lamp).